“I had always heard that horses were very therapeutic, and as the parent of a special needs child, I wanted to better understand this so I began volunteering at Horses Help, a therapeutic riding organization,” said Dannielle Marturana. A high school teacher without prior horse experience, Marturana seemingly was a fast study as she went on to become the volunteer barn manager at a local equine rescue in Phoenix, Arizona. Little did she know that, four and a half years later, her combined experience would lead her to establish After the Homestretch (ATH) in Desert Hills. While working for the rescue, Marturana recalls receiving frequent calls about Thoroughbreds retiring from racing at Turf Paradise. The rescue was usually at capacity and simply could not take in any more horses. “Thoroughbreds are bred for heart, intelligence and athleticism and when they come off the track they have their whole lives ahead of them,” said Marturana. It was this sentiment and the identification of the need for a Thoroughbred focused organization that drove her to establish ATH. In October 2011, ATH took in its first Thoroughbred and now maintains a barn of about 15. Marturana estimates that approximately one-third of the Thoroughbreds in her program come from the track, while another third are turned over by the Arizona Department of Agriculture and the remaining third are rescue cases. When new horses arrive at ATH, they are immediately evaluated by the vet and a plan is developed for their particular needs. They are put on a proper diet and any injuries are treated. A proponent of the holistic approach to rehabilitation techniques such as laser therapy, poultice, chiropractic care and acupressure, Marturana strives to provide the horses “with anything they may need in order to heal from injury” before they enter into a retraining program and are offered for adoption. With this focus on rehabilitation, ATH has again filled a niche for Thoroughbreds in the Phoenix area. The nearby, Equine Encore Foundation, offers sanctuary care for Thoroughbreds unable to progress into a second career, while CANTER Arizona focuses on placing Thoroughbreds into adoptive homes directly from the track. The average rehabilitation period for a Thoroughbred at ATH is four months and during this time Marturana and her all volunteer staff work to determine the appropriate next steps for each horse. Generally, a horse is matched up with a trainer who works to further the knowledge that the horse already may possess. Marturana prefers ATH horses to be in training for about three months prior to adoption to solidify basic ground manners and fill some of the gaps that may exist in their fundamentals. Most horses adopted from ATH are placed in homes as trail or pleasure horses due to prior injuries. ATH currently averages one adoption every month and a half however she is optimistic that this number will increase as she has recently submitted a few grant applications for professional retraining services as horses with some professional retraining are often adopted more quickly. One of the biggest successes of ATH thus far has been the story of Society Girl, a mare that was found abandoned in the Arizona desert. When the 17 hand bay arrived at ATH she was about 400 lbs. underweight. It was clear she had a lip tattoo however it took Marturana and her team months to correctly decipher the faded and illegible numbers. 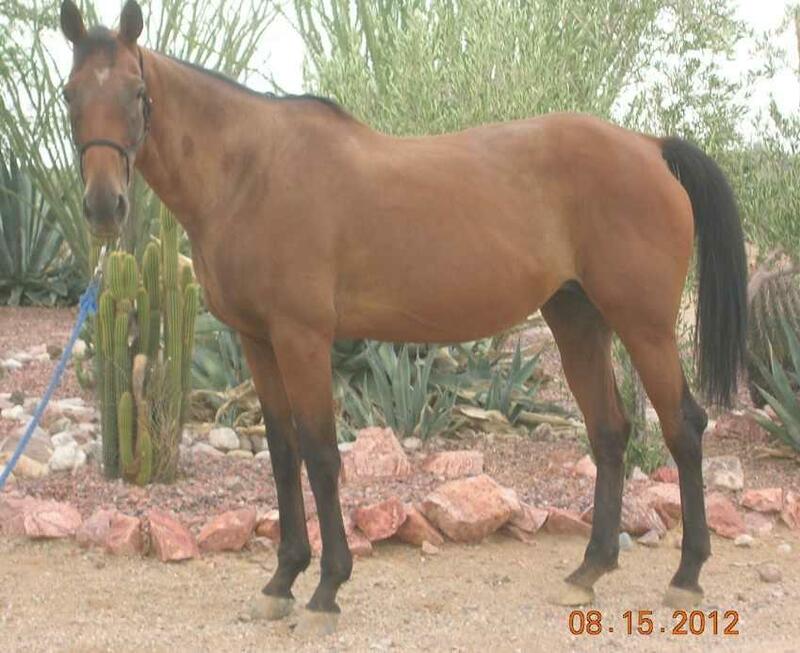 Within six months Society Girl was rehabilitated and eventually adopted by a young rider in the Phoenix area. It is the successes like Society Girl that drive Marturana and ATH to continue. “The happy endings make it all worthwhile,” she stated. After the Homestretch was one of 74 organizations that received a grant from TCA in 2014, and with an average cost of $300 per month to care for one horse, TCA’s grant provides ATH horses with “everything they need,” according to Marturana. This includes hay, grain, supplements and assistance with rehabilitation efforts. TCA appreciates After the Homestretch’s work on behalf of Thoroughbreds.